https://sep.yimg.com/ay/yhst-33477391359232/bird-s-nest-coral-seriatopora-hystrix-brush-needle-pink-nest-5.jpgBird's Nest Coral - Seriatopora hystrix - Brush - Needle - Pink NestDifficultPeacefulYesCalcium, Strontium, Trace elementsIndo-PacifcPocilloporidaeSmall 2" - 3"
Bird�s Nest Coral is a very beautiful introduction in a marine aquarium. Bird�s Nest Coral is difficult to maintain and therefore is best suited for established reef aquariums and expert handling by experienced aquarists. Bird�s Nest Coral however, graces your aquarium considerably by its unique shape, pattern and color. Even the dead specimens of Bird�s Nest Coral are used as curios. The informative article aims to explore the various angles of Bird�s Nest Coral with regards to its maintenance in your reef-type marine aquarium. Taxonomy: Bird's Nest Coral belongs to the Kingdom Animalia, Phylum Cnidaria, Class Anthozoa, Family Pocilloporidae, Genus Seriatopora and Species hystrix. Scientific names: The scientific name of Bird�s Nest Coral is Seriatopora hystrix. Other common names: Bird�s Nest Coral is also commonly knows as Brush Coral, Needle Coral, Seriatopora Bird Nest Coral, Finger Coral and Pink Nest Coral. Coral Type: Bird�s Nest Coral is a Small Polyp Stony (SPS) Coral. Origin or natural range: Seriatopora hystrix is found in Tonga, Indonesia, the western Pacific region, the Central Pacific region, the Indian Ocean and the Red Sea. Color: Bird�s Nest Coral occurs in brown, tan, pink, green, purple and yellow colors. Compatibility: Seriatopora hystrix is semi-aggressive towards the other marine aquarium invertebrates. Bird�s Nest Coral exists in extensive colonies on shallow reef flats in the marine water bodies. Seriatopora hystrix is nocturnal in habit therefore, spreads itself fully at night. Bird�s Nest Coral is hardy as once adjusted, it can tolerate some degree of variation in its environmental conditions. The skeleton of Seriatopora hystrix is fragile and has delicate, irregularly branched stalks with needle shaped tips. The branches of Bird�s Nest Coral may grow up to a length of one hundred and fifty millimeters. Water flow in the aquarium: Bird�s Nest Coral needs strong water current in the marine aquarium hosting it. Seriatopora hystrix requires high-intensity lighting in the marine aquarium it inhabits. Initially place the Bird�s Nest Coral in moderate illumination and once the coral has adjusted to your reef tank�s environment, increase the intensity of light. The Seriatopora hystrix can be placed in a marine aquarium with a capacity of twenty-two gallons or hundred liters and above. You can place Bird�s Nest Coral anywhere between middle and top level of your established marine aquarium. Keep Seriatopora hystrix away from the other members of your marine aquarium as the coral may sting them if they happen to touch it. 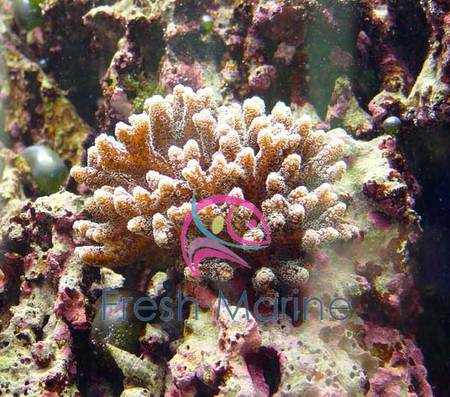 Bird�s Nest Coral grows rapidly and easily once it adjusts to your reef tank�s environment. Bird�s Nest Coral derives its nutrition chiefly through photosynthesis which is performed by zooxanthellae, a photosynthetic alga living symbiotically within the coral. Seriatopora hystrix is Carnivorous in feeding habit and filter feeds a few times per week, when open. Bird�s Nest Coral feeds upon acellular marine invertebrates, meaty bits, zooplankton and phytoplankton. Add Calcium, Strontium and Trace Elements to the water as dietary supplements for Seriatopora hystrix. Maintain the Calcium level in the marine aquarium water at 440ppm. Care: Seriatopora hystrix requires high maintenance. Caution: Keep the other members of your marine aquarium away from Bird�s Nest Coral as it may sting them upon coming in contact with them.